Listen to this track by pop and jazz-inflected concern from Chicago The Sea & Cake. It’s “The Colony Room” as taken from their fifth record Oui released in 2000. The Sea & Cake is something of a supergroup of sorts with each member stemming from local bands on the Chicago scene, including Archer Prewitt of the Coctails (guitar, vocals), Sam Prekop (vocals, guitar) and Eric Claridge (bass and synths) of Shrimp Boat, and John McIntire (drums) from Tortoise. The album was something of a comeback for the band, since all of the members had side projects to pursue after their last one from 1997, The Fawn. But, what did all of those projects bring to this song once The Sea & Cake reconvened? Each member came out of bands that tended to test the limits of pop music, stretching out instrumental passages in order to play with texture and mood, as well as to be catchy with those parameters in mind. By the late 90s and into the 2000s, mixing instrumentation and musical styles this way was a matter of course. The only rules seemed to be about creating an emotional context using any tools on hand. I think that’s why this was such a vital time for independently made music, and why even the majors were beginning to open up a bit to music that was more fluid, and difficult to contain to any one stylistic trajectory, or section in a record store. In this, The Sea & Cake were very well positioned, given that each member had built up a stylistic head of steam before the band even formed. They carried these tendencies into their new band, with lyrical dissonance contrasted with Prekop’s breathy vocals, and with musical ingredients that are unexpected for guitar pop; jazz-oriented, dronily ambient, vaguely orchestral, but decidedly pop, albeit of a very sophisticated variety. 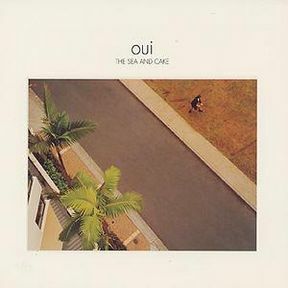 The Oui album which was recorded after a longer gap between albums by the band benefited very highly from the musical journeys of each member, all of whom pursued side projects in the interim. And really, this is another sign of a paradigm shift by this time in pop music history; solo projects and side bands did not mean the end of an act as it most often meant in times past. In fact, it meant new possibilities once the band reconvened. And it would leave a lot of interesting work in the wake of a new record by the whole band. In this case, one of the projects that fed this return to The Sea & Cake was Prekop’s self-titled 1999 solo record on which he explored tropicalia and a kind of indie take on easy listening. Those musical threads could be found on Sea & Cake records previously. But, here on this track, that influence comes shining through. Also, McIntire spent time producing Stereolab, and Archer Prewitt of course had created compelling solo records, following his pop instincts and expanding on his feel for atmosphere, more ambitious arrangements, and mood all at once. “The Colony Room” captures the spirit of the whole album and of those individual efforts that precede it, pulling together their strengths at mixing an orchestral feel to guitar music and to electronic texture. The result is a summery, dreamlike atmosphere, yet also with subtle melodicism, too. And here it’s warmer than their work on The Fawn, with more of a feel that even if this music is about texture and mood, it’s also about four guys playing it together. It feels more like a band, supplemented by woodwinds and brass, of course. The Sea & Cake still maintain their niche audience today, mixing disparate elements together to create something of their own. What they helped to pioneer for other bands coming up behind them was the idea that you could borrow from other musical styles that previously were not really connected to indie guitar music, and get something compelling at the end of it; texture, mood, and a sense of location that gives the usual ingredients of pop music an even greater sense of depth. And you could have parallel solo careers that could feed that directive to make better and better records as a band. You can learn more about The Sea & Cake at the official site. One of my favourite ‘modern’ bands. Got on to them via the brilliant Tortoise and have enjoyed their music a lot – though one does have to be in a certain ethereal mood to fully appreciate Mr Prekop’s breathy vocals! Another excellent signpost (he he) to an interesting and lesser known band. Their sound is pretty low-key, alright. One of the things I love about their music is that they incorporate jazz (which I also love by itself, of course), but it doesn’t overpower the other ingredients. I came to them through Archer Prewitt’s solo stuff, in turn through its comparisons to Nick Drake’s Bryter Layter, which isn’t an exact match but certainly applies.